Imagine turning on the pipes and seeing no water flow. Instead, you spend hours waiting for it to be turned on so your family doesn’t go thirsty. This is normal for millions of households in Asia, Africa, and Latin America, reports NextDrop. The San Diego startup sends text messages to locals in Hubli, India, alerting them 30-60 minutes before the pipes are opened. NextDrop coordinates with utilities to get this information and charges residents 10 rupees per month (about 20 cents). Why is this problem just beginning to be solved? As it turns out, launching a startup in India isn’t so easy. Cofounder Anu Sridharan spent 2.5 months getting an Overseas Citizen of India visa, and cofounder Ari Olmos has to leave every 6 months under his business visa. They also learned to incorporate in the United States first, then apply to become a company in India – which requires bugging lawyers constantly to move the process along. Perhaps more difficult to tackle are sometimes-suspicious customers. Startups in the United States thrive on gathering feedback and iterating, but NextDrop has run into some users who don’t want to be bothered. “When we went to ask people for feedback, people considered us a nuisance and didn’t want to answer any questions. ‘What, all this for a 10 [rupee] service? Just cancel my service, don’t come back,’” recalls Sridharan, who works at their India office. Earlier, they tried to ask residents what bank they used – to explore the option of direct deposit payments – but locals were similarly distrustful. “After 20 households we realized this was a bad idea. Customers got so upset they wanted to cancel the service right there…people don’t trust us yet,” she adds. In late September, NextDrop struggled with a new government regulation: no bulk text messages could be sent between 9 pm and 9 am. Water is sometimes turned on in the early morning, so the company had to either lose a whole set of customers or find a loophole. Luckily, a friend pored over the new legislation and eventually found one. They gathered evidence – official proof that they were working with a water utility – and submitted it to the right people. NextDrop was back up, but not without a 12-day interruption of service (actually quite short in government time, thanks to strong support from their partners at the SMS provider and water utility). Despite these obstacles, NextDrop has attracted over 10,000 customers, in less than five months. It has been awarded a variety of small prizes and grants, including $375k in investment as one of the winners of the Knight News Challenge. The service recently began expanding into slum areas, which will surely bring more challenges. To learn more from NextDrop’s ongoing journey, check out their blog here. 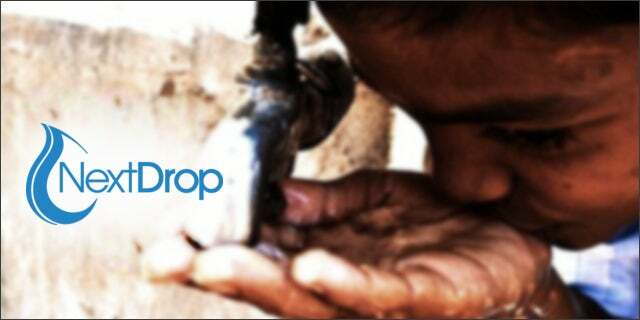 You’ll also find NextDrop at the 2012 SXSW Accelerator as an alternate in the mobile category. Apple has revoked Facebook's permissions to create and operate employee-only internal applications. The social media giant's employees are working to reinstate its “most critical internal apps immediately.” They're also "pissed." Higher temperatures will soon limit bean crop production in Central America, but a potential biotechnology solution has won the prestigious Newton Award. We hear from Dr Caspar Chater, one of the leading scientists behind the research into drought-tolerant beans in Mexico. With China developing AI tech that can recreate news anchors using sophisticated mimicry of real-life journalists, and the White House releasing doctored footage of CNN reporter Jim Acosta, can we no longer trust what we see with our own eyes?